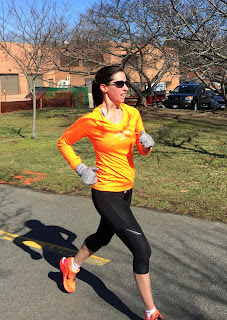 Boston Marathon Training Update: 7 Weeks To Go! I can't believe that I will be running the Boston Marathon in just seven weeks! This has been a dream of mine for over eight years and it's finally coming true. So far, my training cycle has gone well. I've had to make a few adjustments due to weather, like changing workout days around, or running after work instead of the morning, but I'm extremely grateful that I have not yet missed amazingly any runs! I've been getting plenty of sleep, taking ice baths after hard workouts, foam rolling religiously, eating plenty of protein and carbs immediately following my runs, and regularly doing my hip exercises. All of this is simply part of my lifestyle, and it hasn't felt like it's taken over my life. I've been eating a ton, but my weight is the lowest it's been in over 8 years. My coach says this is normal when you change up your training. I've lost about 10 pounds since I started working with him nearly two years ago. My coach has gradually built my weekly mileage, and removed my one rest day at the end of January. As such, I have run every single day in February, which is new territory for me. Ever since I've started running I've always had at least one rest day per week. On Sunday, my prescribed run is "30 minutes recovery or rest," but I've found that my long runs don't beat up my legs too much and I can easily manage those 30 minutes. As the race gets closer and I really want my legs to be sharp, I might opt for the rest option. 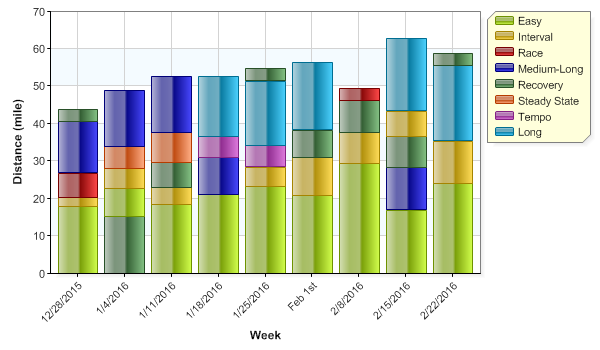 Above is a snapshot of my weekly mileage. One of the interesting things is the lack of tempo runs during the past four weeks. This is because my coach has prescribed tempo intervals instead, which I log as intervals. The great thing about tempo intervals is that you run faster than tempo pace, which is designed to build your lactate threshold more than simply running at lactate threshold. One example of this was on Tuesday, when the workout called for 5 x 8 minutes at medium-hard effort, with 3-minute recovery jogs. Followed by 3 x 40 seconds to keep the legs sharp. My paces were 6:58, 6:57, 6:53, 6:53, 6:52 for each of the 8-minute segments (1.15-1.16 miles each). Another example was two Thursdays ago when the workout called for 8-10 x 1000m with 200m recovery jogs. I polished off 9 of those at paces from 6:45-6:50/mile. I think that workouts like these will make my marathon and half marathon pace faster. I've changed my fueling strategy and it's worked really well. I used to use Honey Stinger gels every 45-60 minutes, but those sometimes upset my stomach. 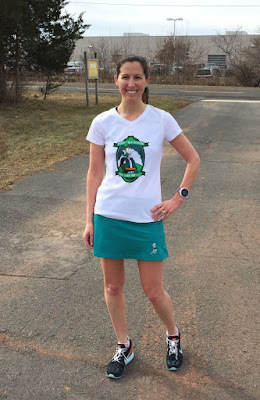 I was able to run my Boston Qualifying marathon with them fine last spring, but during my previous marathon, my stomach revolted and I could only have two of them. I started experimenting with UCAN when I received a prize pack of it from McMillan Running, including all the flavors and pretty much every product they offer. Not once has this fuel upset my stomach, and it lasts much longer than honey, so I don't need to take it as often. It comes as a powder, and I drink it before my long runs, and make a gel out of it to take mid long run. That way I can carry water and put the gel in my skirt pocket. Because the Boston Marathon starts mid-morning, I'm going to start my next long run at 10:30 and eat exactly as I plan to on race day. Whenever I start training for a marathon, I find the first few long runs really hard, and then my body adjusts. I ran 20 miles yesterday and it didn't feel as challenging as some of my earlier long runs, which were 15-16 miles. I'm trying to incorporate hills into my long runs and easy runs so that my legs will be ready for those on race day. 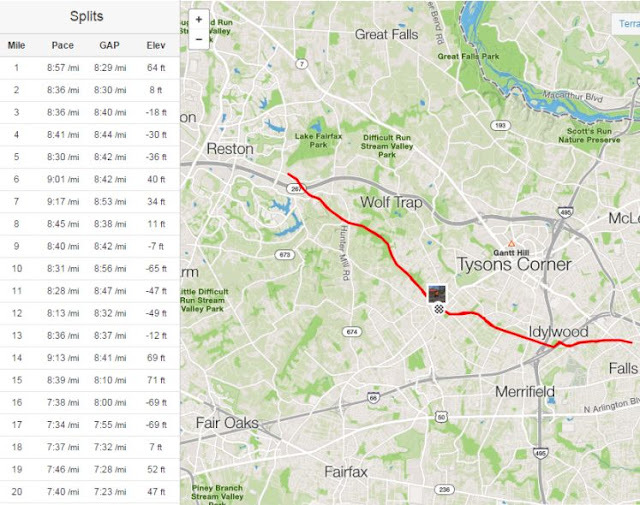 When I ran my 20-miler yesterday, the last 5 miles were at marathon pace, and the last two miles had an elevation gain similar to some of the Newton hills. Here are my splits from yesterday's run, with my average heart rate in the middle of my Zone 2 (aerobic zone). This was extremely encouraging. My training plan for the next several weeks looks really, really intense. I hope I am able to continue to crank out these runs as well as I have been for the past nine weeks.